The procession leaves at 12 noon from City Park on Alexandra Parade. As well as the carnival procession, there will be the usual excellent array of inflatables, markets, sports, arts and live music. 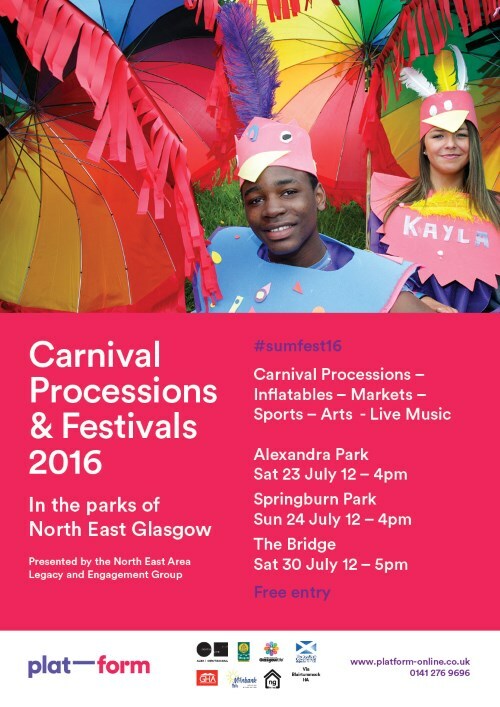 If you would like to volunteer and contribute to the success of the local event, see the Glasgow Life website here. If you want to sing, dance or perform with your band on the Festival Stage contact James Dean via James@platform-online.co.uk for more info. Or, to take part in the Carnival parade and get your group dressed up for the festival or be part of the summer arts camps contact Paul Marsden via paul@platform-online.co.uk for more info. The festival is presented by the North East Area Legacy & Engagement Group.